If you exported entries from Gravity Forms, you will not need to modify formatting. The details provided below are for additional information as well as formatting CSV files when importing from other data sources. These fields support "free text", which can be values saved as plain text. Imported values must match the text of the option exactly. For these fields, if the field has the "show values" checkbox checked, make sure that the imported text matches the "Value" values, not the "Label" values. Only one value may be imported. Multiple values may be imported, separated by commas. Will import the "Apple", "Orange", and "Pears" options. Will import the "Apples" and "Pears" options. Will import the "Apples" and "Pears" options, because the Banana option does not exist for the field. When mapping a Full Name, Prefixes ("Dr", "Ms", "Mr", etc) are not currently supported. Single uploads should be the full URL to the file. Multiple uploads should be formatted as a JSON array, without escaping slashes before the / character. 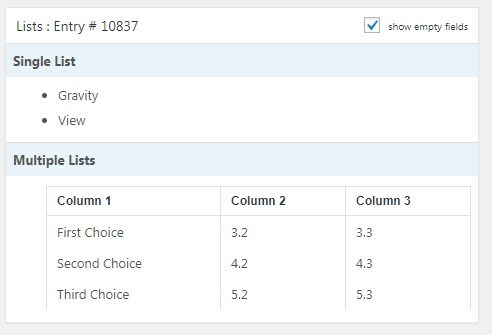 If your field is named "Multiple Lists" for example and it has three columns, we suggest you create three columns on your CSV file and during the import process, map each one of these CSV columns to a column of your Multiple Lists field. yyyy-mm-dd is a date format you can always use, but you can also format the date based on the Date Format of the target Date field. Make sure the Gravity Forms field's Date Format matches your chosen format. You must use two digits for hours and minutes, you can't use a single number for hours. Example: 9:00 is invalid; use 09:00 instead. If using the International setting, no validation occurs. If you encounter any import issues, you may want to consider updating your form to use International phone number format during import. Entry notes can be added to imported rows. The notes can be formatted as plain text, or as a JSON array of multiple notes. Plain text example: This person has been amazing to work with. You can also specify the user to assign to the notes by mapping the "Entry Note Creator" dropdown. This should be the ID of the user to assign the note to. Otherwise, the note will default to being created by the currently logged in user. If the Post ID is mapped to be imported, the import will attempt to update an existing post with that ID. If a post with that Post ID does not exist, none of the post fields will be processed. If a Post ID is not mapped, then a new post will be created. http://example.com/my-pretty-pony.png|:|My Pretty Pony|:|This is my pretty pony running in a field|:|What a wonderful day I had with my pony. The field was so green! http://example.com/my-pretty-pony.png|:||:||:|What a wonderful day I had with my pony. The field was so green! If you are passing a Post ID to the importer, the post must exist on the site. If not, the entry will not be created. Post tags should be formatted with tags separated by commas. Post categories should be formatted as a JSON array, with the ID of the category as the value. Note: If importing a Gravity Forms export file, you won't need to modify anything. To import multiple options at once, map your data column to the Option field that has (Selected) added to the end of the Option field name. By default, Gravity Forms exports options as their own column. You can map each Option individually, or you can import multiple Options at once by mapping with the field's "(Full)" field. If you want to set multiple options at once, separate multiple Choice Labels or Choice Values with commas. The data must match the Choice Label for the Option you are importing. If the "show values" checkbox is selected, you can also use the Choice Value. For the example, both First Choice and First Value will work. If empty, the Option will not be selected. You can override the price using "Overriding Option Prices" format below. If you have an Option with a label of "First Option", a value of "First", and a price of $15.00, it would be formatted like First|15.00 or First Option|15.00. The separator is a vertical pipe bar | character. Specify an Entry ID number, and the Importer will update an existing entry, if found. If an entry is specified but not found, there will be an error. If empty, a new entry will be created. When doing this, the existing entry will be completely overwritten—nothing will remain of the original entry. So make sure you have a backup and are completely aware of the risks of overwriting entries. If possible, we recommend adding new entries and deleting old ones. You have been warned! User Agent: Provides the name and version of both the browser and operating system from which the entry was submitted. Example: Mozilla/5.0 (Macintosh; Intel Mac OS X 10_10_3) AppleWebKit/600.5.17 (KHTML, like Gecko) Version/8.0.5 Safari/600.5.17. Note: If blank, the Entry Importer will add a custom User Agent to identify the entry as being imported by the plugin. Is Read: Indicates if the entry has been read. Set value to 1 for entries that are read and 0 for entries that have not been read. Is Starred: Indicates if the entry has been starred (i.e marked with a star). Set value to 1 for entries that are starred and 0 for entries that are not starred. User IP: Client IP of user who submitted the form. Source URL: Source URL of page that contained the form when it was submitted. These field types have not yet been added to the Importer. We're working on adding support for these.